North 53 is a new restaurant in Edmonton located on the trendy side of 124 street. If you’ve never eaten here, the server offers a brief explanation of the restaurants’ concept. Their aim is to serve Canadian cuisine with locally sourced and exclusively Canadian ingredients. This means no pepper, and in the early spring the fruit is canned and there aren’t as many vegetables as they would like. 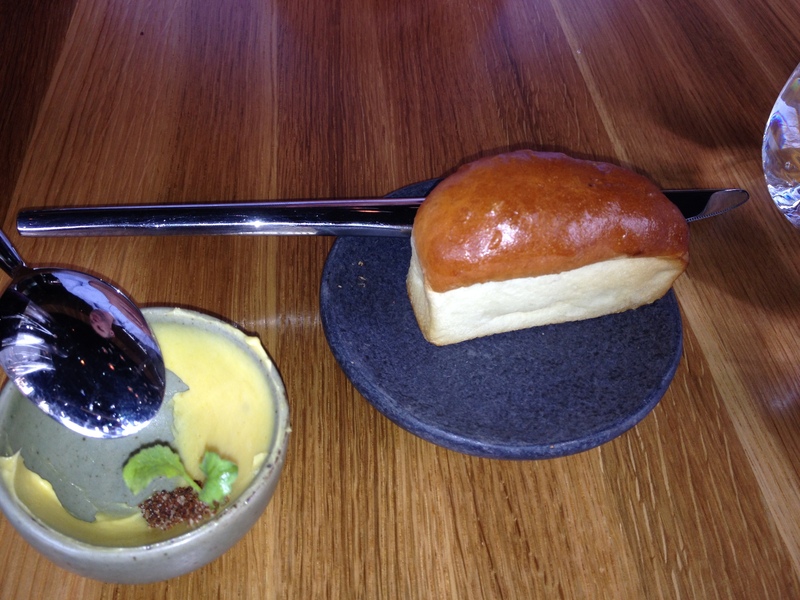 Their dishes are on the small side (3 oz) with the idea that you can try a few different items. Eating here is a dinning experience. It’s like being a judge on Iron Chef while playing the straight man in a theater of the food-absurd sketch on SNL. But in a good way. Each dish arrives with a detailed description from the server, which is necessary because otherwise you wouldn’t know was on your plate, or in the chef’s mind. Our sever greeted us with complimentary champagne because he know we were celebrating. I think I may have mentioned our anniversary when I made the reservation online. Each item on the menu is so unique, so we took advantage of the special Six Course Tasting Menu, which includes three snacks, two bites, and dessert. At $85 per person this is one of the most expensive dinners I’ve ordered. If you’d like to add the wine parings, it’s another $50 each. Before we got started it smelled like Cheech and Chong had won Master Chef. The odor was pungent! It turned out to be the Chicken Cooked in Hay. The dish was being served to a nearby table and came covered with a glass dome full of smoke. The smell didn’t last but it was rank. Since it wasn’t part of the tasting menu I can’t give you a review. Dinner started with pinky finger-sized amuse-bouche of a stuffed rolled leafy green. I forgot to take a picture, and it’s not mentioned on the online menu, so I can’t give you any more details. Except, it was good start to the dinner. We tasted it carefully, discussing each flavor and texture, and enjoyed both bites. The following are my pictures along with the exact description from the menu. If you have good attention to detail you’ll notice that the scallop dish has nasturtium leaves even though the duck breast’s description includes nasturtiums. 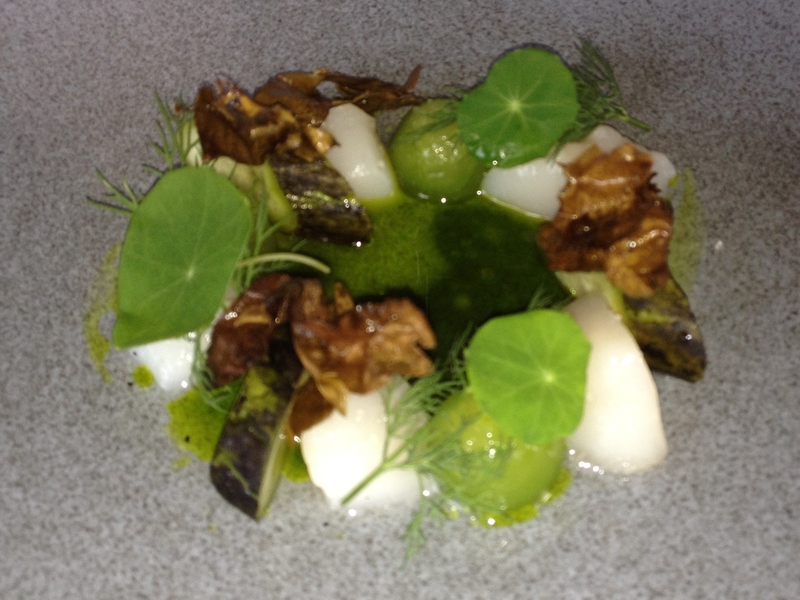 The first “snack” was raw scallops with compressed cucumber and dried seaweed. You haven’t had cucumbers until you have had compressed cucumbers. Oh wait, yes you have. I really liked this dish. The delicate, cold scallops went well with the crispy, salty seaweed. The second “snack” was elk tartare. The entire combination was wonderful. 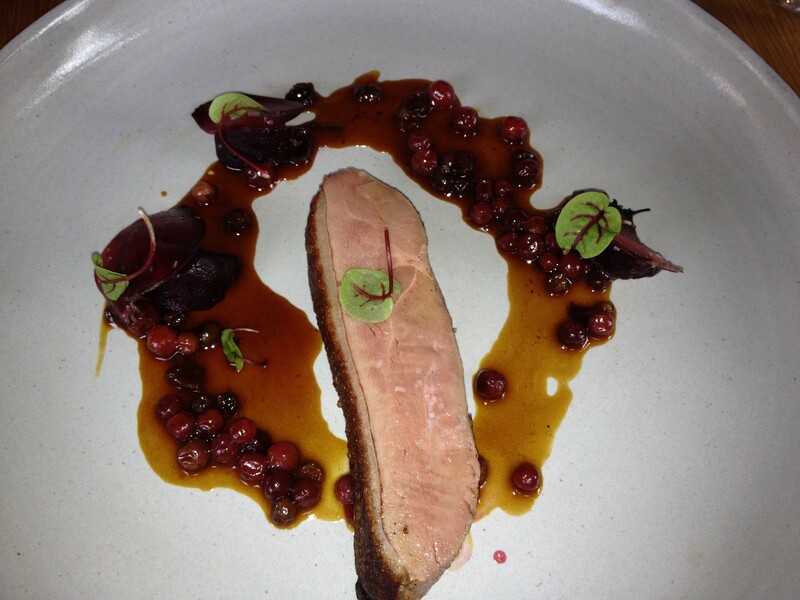 The elk, with the sweet berry, dill, creamy sauce, and salty/crunchy flakes was amazing. You can really tell that the (iron) chef put a lot of thought into each ingredient. But Cured Heart? When the server said Cured Heart I couldn’t help but laugh. Is it really a remedy to being heart-broken? The final “snack” was duck breast. The skin was removed from the meat so they could be cooked at different temperatures. The skin was seared on high heat and the breast was cooked at a lower heat to render out the fat. Then they were put back together and served with lingonberries. I’m not a huge fan of duck, mostly because of the fattiness, but this was really nice. Delicious! This pain au lait was buttery and soft and tasted exactly like I remember it in France, even though it was only four inches long for both of us. 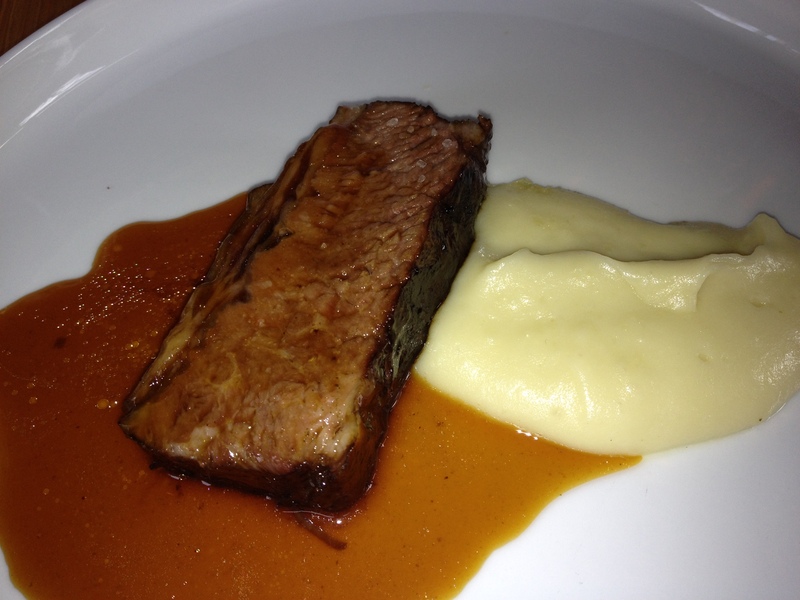 The first “bite” was a short rib and mashed potatoes. Cooked at 76 degrees for 24 hours, this was by far the best dish of the whole meal. I can’t really articulate how amazing it was, except that it fell apart with just a fork and the plum glaze was the perfect accent. The potatoes were silky smooth, because they are mostly butter and cream. Ina Garten would be proud. 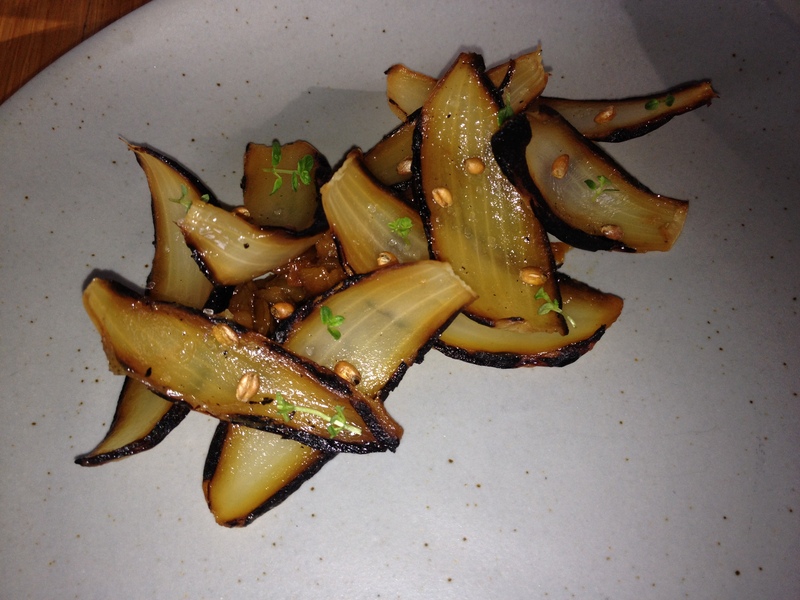 The last “bite” was caramelized onions with puffed wheat. Surprisingly sweet, these were my least favorite dish. They tasted like onions. With crispy puffed wheat. The problem with this dish is I feel I could easily recreate it at home. 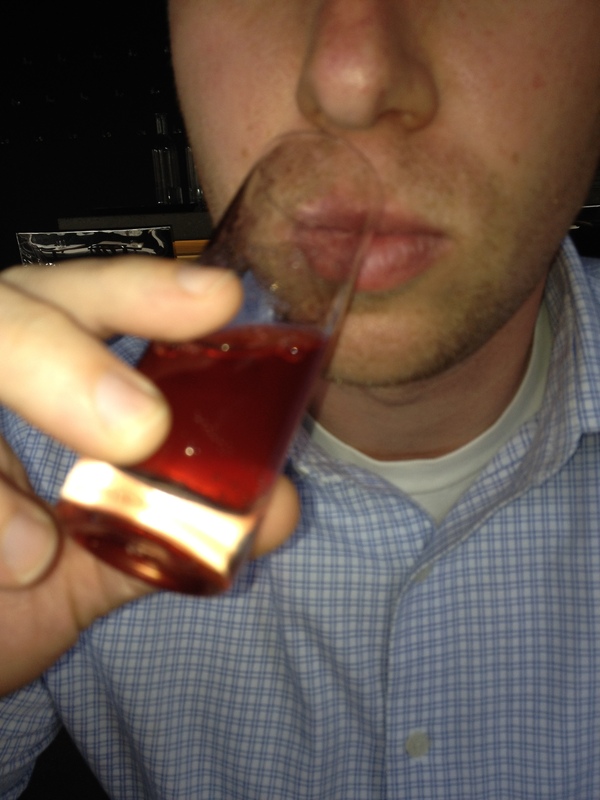 Next we have a shot of homemade cherry seltzer for a palate cleanser. I’m a huge fan of sparkling water and fruit juices, and this was very balanced drink – just enough sweat and tart. I would order this anytime. Finally came dessert. We got two different desserts because my better half has a strawberry allergy, so they were able to offer a blueberry alternative. I got preserved strawberry (more like strawberry juice) with crème fraîche ice cream, red pepper for crunch and thai basil. The iced cream was really smooth and went perfectly with the sweetness/tartness of the strawberries. Basil and peppers may seem like an odd addition but I feel that it really worked. 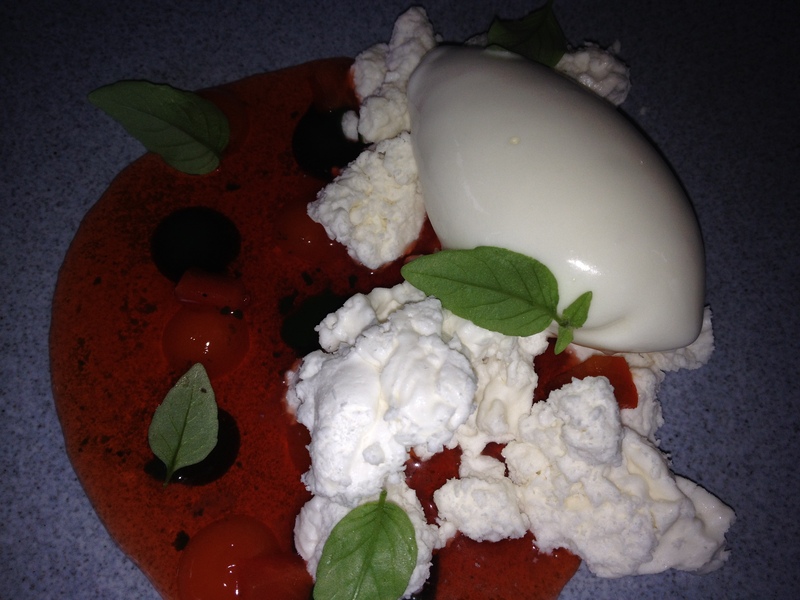 The basil was refreshing, like mint might be, and the red pepper’s sweetness went well with the strawberries. Hubby got blueberries, tarragon ice, goat’s milk ice cream and oats. The combination was just a little too unusual for him. I liked the goat’s milk iced cream, it tasted like coconut pudding. But the tarragon ice looked strange, and tasted like it sounded. I know they are trying to push the limits of how we define Canadian food, but you know what’s really tasty? Saskatoon berry pie and cow’s milk ice cream. I’m just saying. 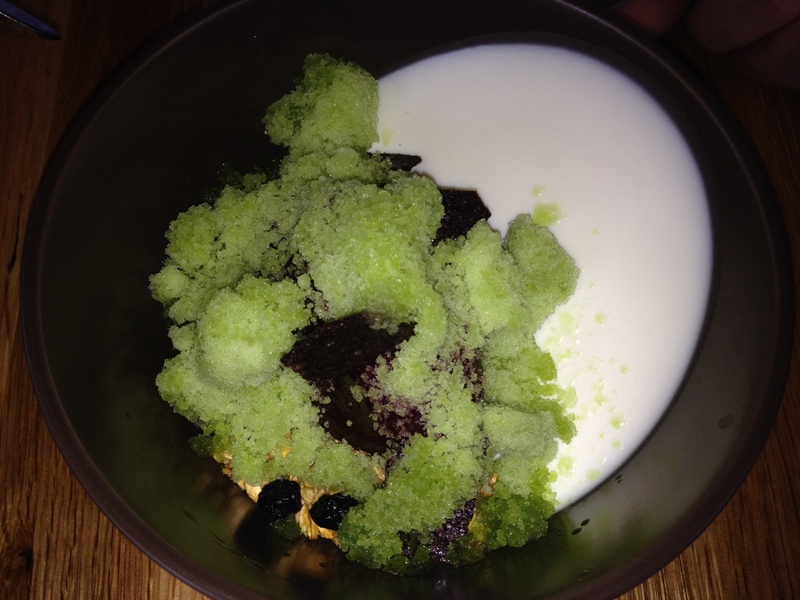 Blueberry compote, tarragon ice, goat milk ice cream, oats. No dinner mints here. The final bites were a salted caramel and marshmallow with honey. This is probably the smoothest caramel I’ve ever had. 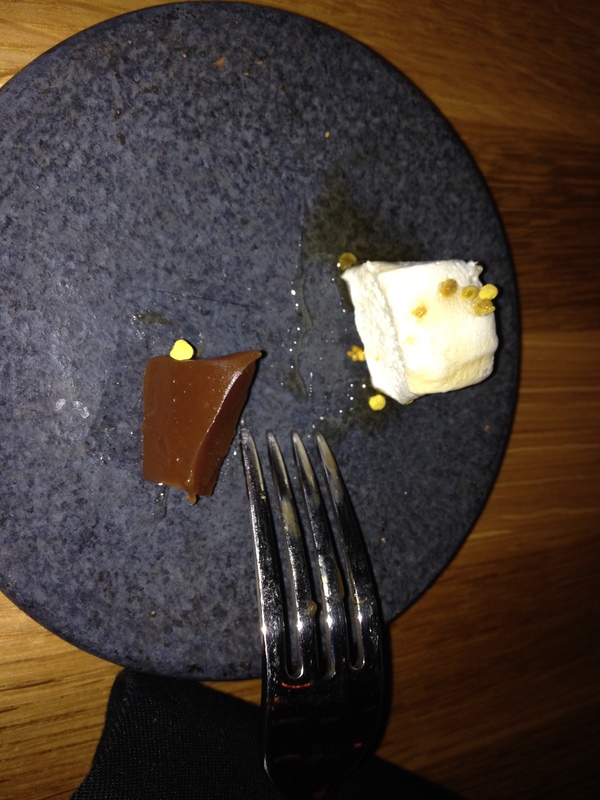 And the honey was a very delicate accent to the marshmallow. A very nice ending. I had a really good time at North 53. Our six course tasting menu actually included ten different dishes. Everything we ate was interesting and complex. It was really fun to think about the different flavours and make an opinion on what we liked and didn’t like. Even though the dishes are small, we were well fed. I liked that we got to try all sorts of unique dishes. Service was good and the ambiance is lovely. But this is a restaurant for a select demographic. It’s for people who have an adventurous palate and are comfortable spending $200 – $300 for dinner for two. Personally, I’m only the first one. I liked the meal as sort of a dinner and show, but I can’t see going back any time soon. It’s just too pricey for me. And now that I’ve tried elk tartare and tarragon ice, I don’t need to hurry back for more. If I had to complain about anything it would be these few minor issues. The restaurant wasn’t full, yet they sat everyone right next to each other. I prefer more space when available. They could use a longer play list because we heard the same Norah Jones song a few times. And they spelled crème fraîche wrong.